'A generation ahead' of the competition, it claims. 'No safety issues,' says the company. Drops its orders dramatically, takes a financial hit. 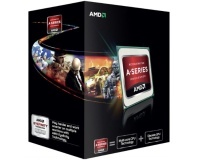 Get DX11 gaming on your thin and light laptop, as AMD shows its new Fusion CPUs for the first time. 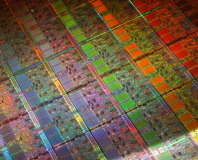 COMPUTEX 09: AMD, TSMC and Microsoft gave us a glimpse of DirectX 11 and Codename Evergreen, AMD's next-gen graphics chip. 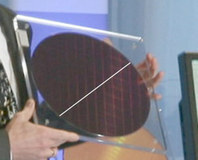 After being pictured with a wafer at IDF in China, bit-tech calculates how big Pat Gelsinger's new Larrabee core will be. 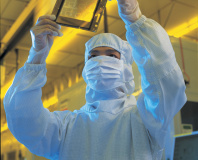 Intel, Samsung Electronics and TSMC have collectively agreed to push forwards with plans to move to 450mm wafer production starting in 2012. 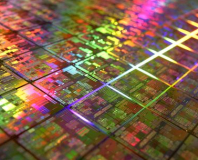 Yes, you guessed it: another possible future processor technology. This time it's the stuff in pencils rather than the stuff that comes out of torches that'll save us all. 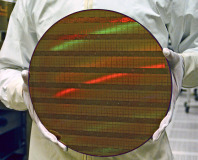 At an event in California, AMD has demonstrated its upcoming Barcelona CPUs and R600 GPUs, as well as 45nm wafers for the first time. 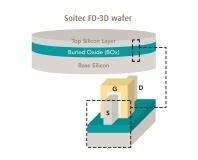 Taiwan Semiconductor Manufacturing Company has announced that its 55nm process technology is ready for use in large scale production runs.